Monster Energy Supercross is getting a Texas-size welcome to the Lone Star State, and many riders will be leaving here with specific marks to remember the day. We’re talking bumps and bruises. This track is hard and slick and that’s caused a lot of crashes, both from riders washing out in corners and also from clipping the tops of jumps. The dirt is so hard that the jumps don’t have any cushion if you short a landing. Basically, there’s no room for error with this dirt. In fact, we’ll just warn you now that practice times today were adversely effected by the numerous red and yellow flags, downed riders and traffic. 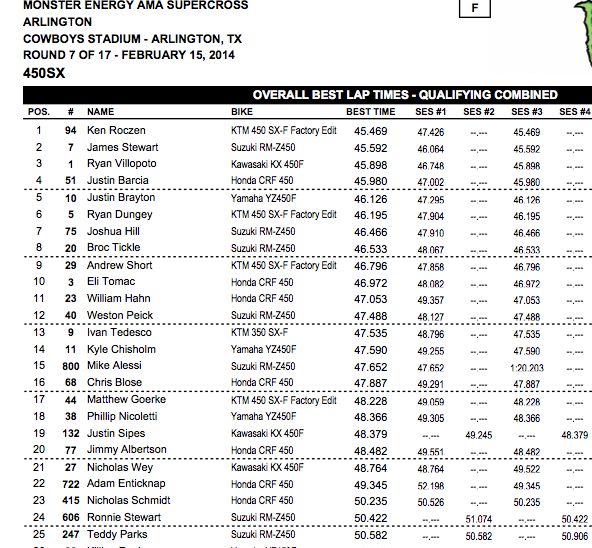 The first timed 450 session, especially, saw very few riders even get in clean laps. Things seemed better in the final timed session, but still, there were bikes down everywhere. Also, the practice sessions for the 450s were exceptionally crowded. There weren’t enough bikes to create a third group for practice, but there were a few extra riders inserted into the A and B groups. That creates more traffic. In the end, Ken Roczen, who never get a clean lap in during the first timed session, wrestled with James Stewart for the fastest time in the second one. Stewart was going really, really fast all day, but sometimes was too fast for this slick track. We saw some close calls from Stew in the first session, but he did end it with less dirt on him than some others who actually crashed—at one point RCH Suzuki riders Josh Hill and Broc Tickle crashed in the first turn in consecutive laps! Can you say slippery? Then in the second session Phil Nicoletti crashed, then a lap later Wil Hahn went down in the same turn. Later, Nick Wey hesitated in a corner and Stewart bumped into him, sending both down. Just chaos out there. In the background of all that, Chad Reed did a few laps in the first practice and a few more in the final one before pulling off. We’re now hearing Chad is officially out—he gave it a go and a great effort, but his attempt for a storybook championship season appears to have come to an end. 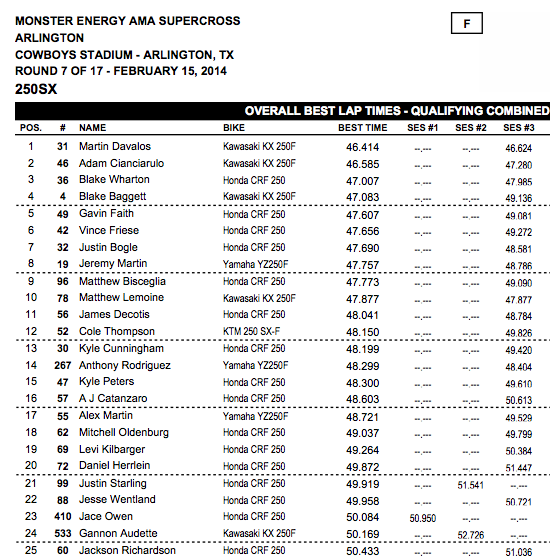 Practice for the 250SX riders was basically a 1-2 show for Monster Energy Pro Circuit Kawasaki, with Martin Davalos and Adam Cianciarulo going back and forth for fast time. Davalos looked fast every single time he hit the track, Cianciarulo would log fast laps here and there to match him. In the final session, they were a full half second quicker than anyone else. The rest of the class is wide open, with GEICO Honda’s Justin Bogle and Blake Wharton in the hunt with fast times, Blake Baggett looking a bit off in the first session but coming back for fourth in the final session, and Gavin Faith and Vince Friese showing privateer power by flirting with the top five. But speed is only one thing on this track. The combination of a short start straight, 90 degree first turn without a berm and this slick dirt should make for some crazy first turn action in every race tonight. Getting through there in one piece could make a bigger difference than anything else.